As a life long learner, working in a school is the perfect environment to be. I am fortunate to have an employer that encourages an enquiring mindset and is willing to invest in it’s staff, recognising that it will benefit and grow the organisation. 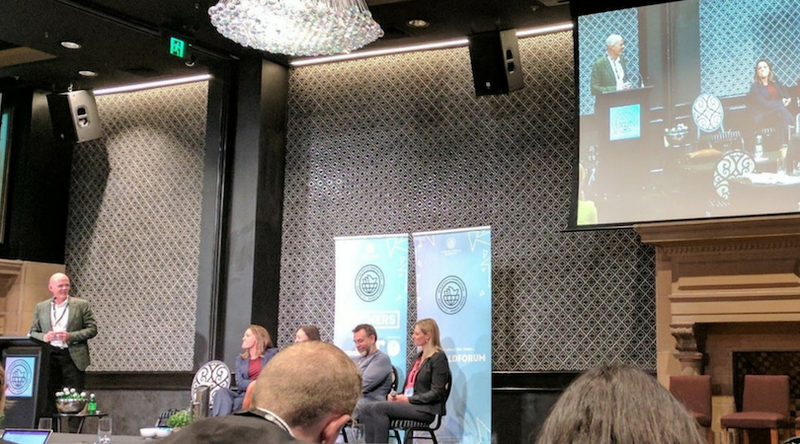 This week on Wednesday and Thursday I attended the Strategy & Innovation Forum ( #SIWorldForum ) in Sydney with my colleague, Francesca Conte, Community Enterprise Manager of the Centre for Educational Enterprise. We quickly came to realise that we were the only representatives from the K-12 Education Sector and that there were only two others there from Education, a representative from the Australian Catholic University & another from TAFE NSW. Also in attendance was each of the big Australian Telco’s, Banks, Energy & Insurance Companies, Aus Post, CSIRO, ABC, Toyota,Transurban, Deloitte, Colliers, PwC, Lendlease, Clayton Utz, M&C Saatchi, Nestle, Cricket Australia, Retailers such as Harvey Norman, K-Mart, Kikki.K & then some of the ‘disruptors’ such as Facebook, DropBox and Deliveroo. If you don’t believe the job market is changing quickly some of the job titles we saw will surely convince you otherwise: Director Transformation, Knowledge Capture Manager, Head of Innovation, Strategic Intelligence Manager, GM Future & Innovation, Chief Experience Officer, Digital Innovation Lead, Head of Technology & Innovation, Head of Legal Innovation, Head of Operations Strategy, Director Engagement, Head of Design innovation, Head of Strategic Performance and right down to the absurd from a company called Crazy Might Work: Chief Combobulator, Ambassador of Awesome, Minister of Creative Affairs and Denizen of Disruption! Talk about there being opportunities for young people, why apply for a job when you can go out there and create your own! (One of my favourite reads of 2016 was “Don’t get a job….make a job. How to make it as a creative graduate” by Gem Barton). and these three apply to us all, no matter your title, sector or organisation. Working in a girls schools full of high achievers we work hard at giving our girls opportunities to take risks and accept that failures are just part of the learning process. Personalisation of learning has really come into focus for us this year with the new Senior Years program where every girl has an Academic Coach, Wellbeing Coach & a Fit For Life Coach supporting them through their personalised academic course in which they start choosing their pathway in Year 7, via a full choice offering. Of course it’s all about the people and school communities are large and ours includes: Students, Parents, Teachers, Professioanl Support Staff, School Council (Board), Past Students, Past Parents, Past Staff, our vendors/suppliers and contractors, however it is the students who are central to everything we do and every decision we make. It’s my personal belief that girls schools are leading the way when it comes to strategic planning, future forecasting and innovation and that’s because we have to. We know that at any moment we could lose all government funding. In Melbourne at least, the girls Schools are plentiful and they don’t have the funds, or fundraising opportunities of the boys schools with the strength of their Old Boys networks. The “Old Girls” of girls schools were forced to give up work as soon as they married, or fell pregnant, and all finances right down to donations and bequests after their deaths were strictly controlled by the husbands. The schools who are innovating and disrupting now will be the survivors and just wait until our more recent Old Girl communities come of age, perhaps we’ll begin to see the boys schools innovating. Anyway to all those at the Forum this week, who talked about “cross-sector research”, we hear you, BUT we never see you visiting our schools or attending Education conferences so reach out and come and visit. Otherwise I think we’ll be forced to return next year and present, as I’m pretty confident you’ll be blown away by some of our initiatives and think that in the near future you’ll be knocking on our door for our graduates, and before they even have the chance to complete a uni degree!